What a summer it’s been. It started out with an extended weekend to Door County, Husby’s and my go-to place to get away from the hum-drumedness of the everyday routines we have. It’s always refreshing and has become quite comfortable. We’ve gotten to know people who used to just be familiar faces, we devour our favorite meals at fun restaurants, and we revel in the company of mighty Lake Michigan for hours on end. I’m the luckiest girl in the world because not only did I get to have a mini vacation with Husby, I got to have a major vacation with Charlotte…to Europe! Oh, the sights we saw, the people we met, and the feelings we had. 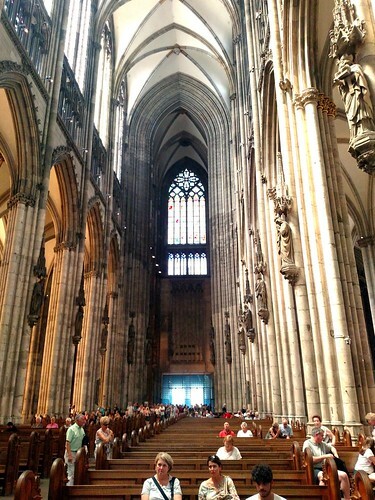 It was my first time visiting countries not attached to my homeland, and it made a huge impression on me. So huge I’m still trying to get my head around it. 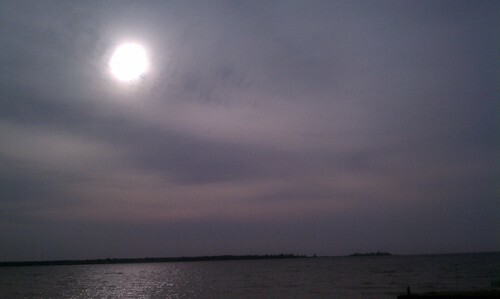 Everything I saw and did was awesome, in the truest sense of the word. 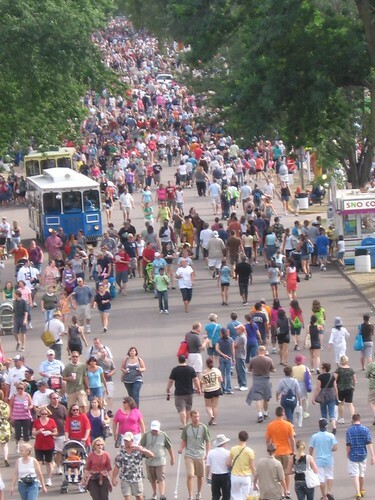 Next on the summer agenda is the Minnesota State Fair, which begins in nine days. There will be much eating of things on a stick, taking in animals and art and carnival, and general hobnobbing with millions of fellow Minnesotans. When it’s cold and snowy (and it will be soon enough) I’ll have warm memories of the Summer of ’15. Making memories – that’s what life is all about, isn’t it? 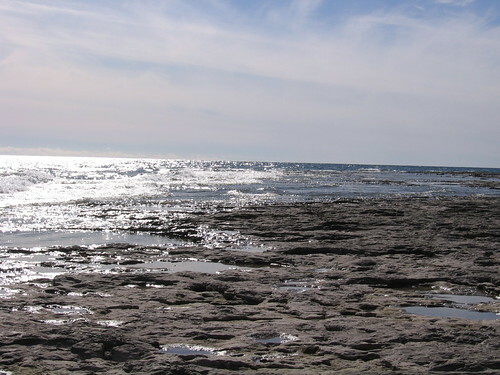 I just returned from a relaxing and rejuvenating getaway to Door County, Wisconsin. I don’t know how many years Husby and I have been going there, but it never disappoints. The tiny motel in which we stay is tidy, clean and unpretentious, but offers a most spectacular view of Lake Michigan. Not only that, the house which inspired my novel-in-progress is right across the street, so I get more writing inspiration every time we visit. 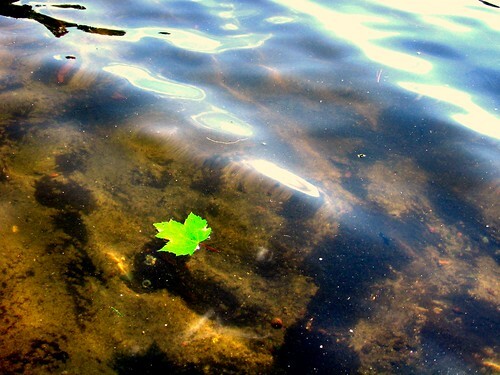 Speaking of writing, I tried something novel and daring while we were on our retreat. I didn’t take my laptop with me, and when I wanted to write I did it by hand. Yep, I took a note book with me and put my cursive writing to action instead of tapping away on a keyboard. I must say it was refreshing, and I was surprised at how the process of writing is different when doing it by hand. I felt like things flowed from my mind through my arm and out the pen in a more thoughtful way. Also, I didn’t feel so detached from what was going on around me. I may begin a practice of writing by hand every day, even if it’s just a stream-of-consciousness thing. I really enjoyed it. 1. The Minnesota State Fair was the highlight of August. One special thing Husby and I had the opportunity to do, in recognition of our contributions to the Minnesota State Fair Foundation, was dedicate a bench. (Benches are a necessity at the fair ~ I’m finding that out the older I get.) We dedicated it to Dad and my brother Diggy, who died just before his 26th year of working at the fair with Dad. 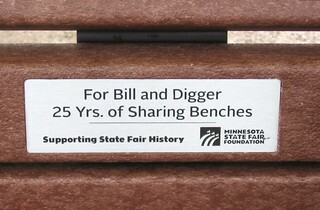 The small plaque on the back of a bench dedicated to Dad and Diggy and twenty-five years of working at the fair (and taking bench breaks) together. 2. September was full of craft shows. I was at the Dancing Dragonfly Winery, the Chateau St. Croix Winery, and the Baker Orchard, all in Wisconsin. I love Wisconsin. I went into each of these shows with doubts of one kind or another, but they all turned out to be fabulous. 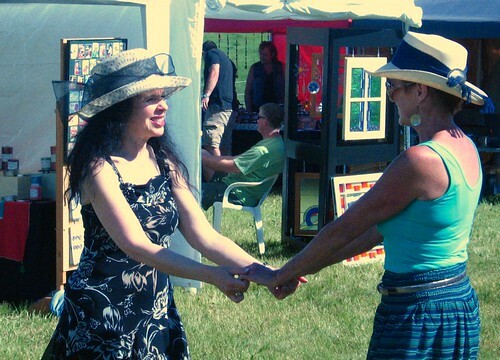 The organizers of the shows did a tremendous job, it was a blast to spend weekends with my fellow artisans, and of course the food and music at all of these events were wonderful. Husby and I have a special place in our hearts for Dave Ybarra and the Northside Dukes, who have twice invited us up to the stage to do the Hand Jive. They played at both winery festivals, so we got our share of the blues. 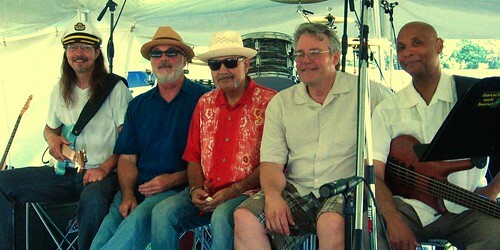 Dave Ybarra (center) and the Northside Dukes. Premium blues band. 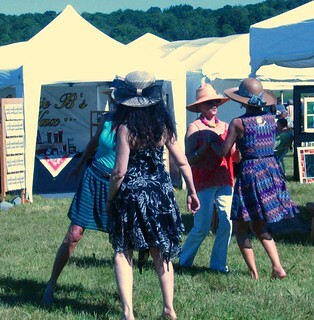 Four ladies dancing it up in front of Auntie B’s Wax’s canopy. 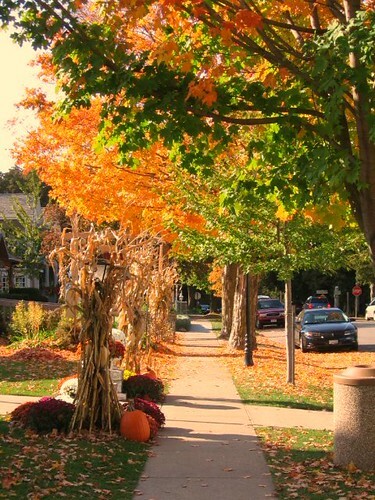 A lovely autumn in the County of Door. 4. There was also a trip to the family cabin to close it up for the winter. There was much raking and other miscellaneous chores to be done before the cozy little cottage is left to weather the forthcoming winter on its own. One never knows how it will fare, as it was built in 1950 by Grandpa Mike…from scraps. 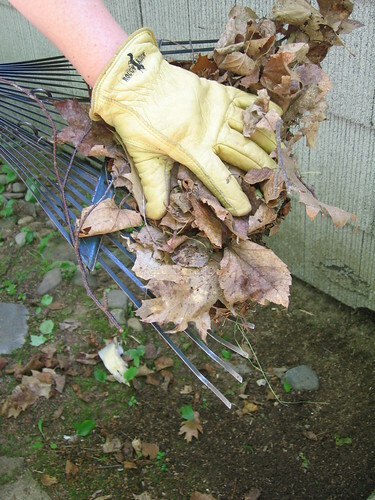 Work gloves and rakes were the tools du jour at the family cottage. What now? There’s still a lot to do, but the chaos of deadlines is behind me for the moment. This is the time of year I cherish and I plan to enjoy it to the hilt. I have lots of projects in store for our home and a list of hot, comforting food to make during the chilly and downright cold months to come. I also hope to visit this site more often too, documenting happenings at the Auntie B’s Wax World Headquarters. I’ve been away too long. Caught in a generation with one foot in the old school and one in the new I have a hard time realizing how important being online is to a business these days. Keeping up with an online presence is exhausting for someone in my predicament. I get all kinds of advice on what platforms to appear on, and then hear that it doesn’t make any difference at all. Some say Facebook and Twitter are the way to go. Others say those platforms are useless and a e-mail list and monthly newsletter is the way to go. I admit, I’m utterly confused. And what do I do when I’m utterly confused? I retreat. I’ve put my Etsy shop on vacation simply because it’s online. Online selling is the new school way of doing things and I’ve become overwhelmed. I’m not keeping up with my Facebook page or Twitter and and quite frankly updates on those platforms are automatic and take no thought on my part at all. I feel like that’s really bad because I’m not actively engaging my customers. The simple fact is, I don’t know how to do online stuff and quite frankly I don’t care what everyone says. I don’t want to be consumed with what works and what doesn’t with an online business because you know what? I have a business that’s live too! But I’ve been falling behind in that also. Work work work. That’s all I do, whether I do it right or not. You know what that means? It’s time for a vacation. And guess what? I’m going to have one! 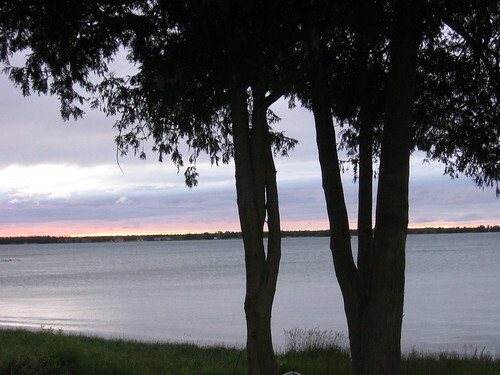 Right now I’m looking forward to a trip to my beloved Door County with my beloved Husby. And what makes it even better is the fact that I’m not going to do a show while we’re there. For the past three years or so I’ve done shows in various locations in Door County and they all turned out pretty much disastrous for me only because I had to travel six hours to do shows that weren’t too lucrative or else blew my canopy to the other side of town. 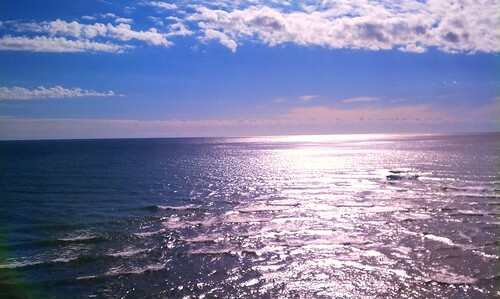 In a couple of weeks I’ll be basking in the glory that is Lake Michigan. 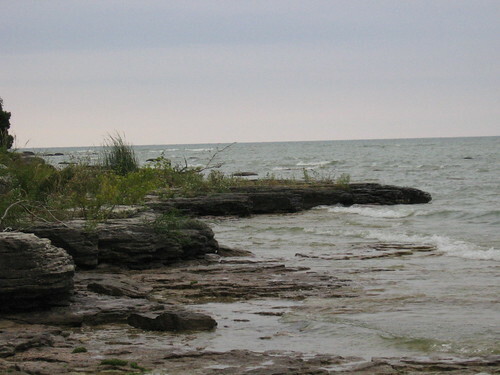 I’ll be sipping wine with Husby at our favorite haunts and hiking the rocks and dunes that surround the great lake. I’ll be watching sunrises and sunsets that make all of life worth living, and I’ll be eating food so good it should be illegal. Until that time I’ll plug on, even though I’m not completely plugged in. See this guy? When I saw him I wished I could do what he was doing, though what he was doing specifically I couldn’t tell you. I like to imagine he’s working on writing a piece of historical fiction. He looks like a historical fiction kind of guy. Of course he could be doing the paperwork for his construction business or something, but in my mind he’s an author. Probably because I fantasize about being an author. 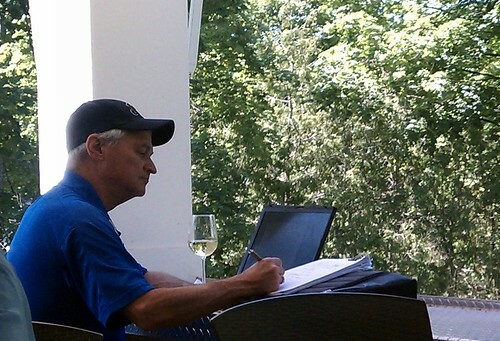 The best thing about historical fiction guy is the fact that he’s having a glass of wine while he works. 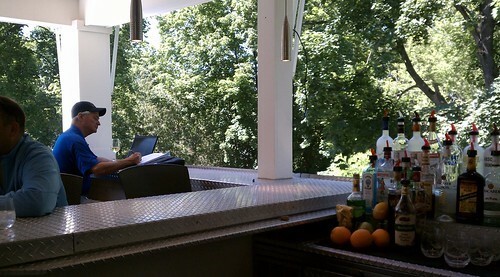 What a perfectly wonderful place to work, up in the trees, and with a glass of wine. Wine and trees can be found at Cooper’s Corner in Fish Creek, WI. That’s exactly where this guy was when I saw him. The bar area of Cooper’s Corner is practically en plein aire on the second floor. Husby and I spend a little time here when we visit Door County. We sit and talk about our dreams and aspirations over a glass of wine or two while we enjoy the cool breeze blowing through. The last time we were there I saw historical fiction guy. It’s pretty unlikely that I’ll be buying a get-away writing abode anytime soon, so I decided I’m going to pack up the laptop and spend my summers writing at Cooper’s Corner with an endless glass of Pinot Grigio within reaching distance. Cooper’s Corner. All about dreams and aspirations.